It has a patented formula designed to give the ultimate finish to your hairstyle, with optimal shine. L’Oréal Professionnel Infinium Extra Strong has an anti-humidity action, so your hair keeps its style even in humid conditions. Used sparingly it's perfect for my fine hair. I have used this product since I let my hair grow. It brushes out easily and leaves no sticky feel if it gets damp. Send me wrong product and won't send the right one. Can't say anything about it. I love this Hairspray but can't use anymore because you send me a new version and won't send the old one which I ordered. 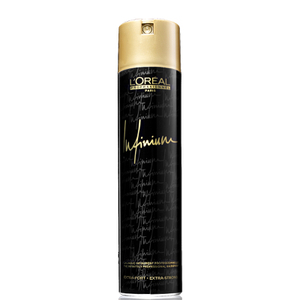 Lots of good points about this L'Oréal Professionnel Infinium Lumiere Extreme Hold. It has a nice scent, hair retains shine, hair doesn't dry out as with other hairsprays and it brushes out well. However the hold doesn't last long and it doesn't have the "extreme hold" I anticipated. This L'Oréal Professionnel Infinium Lumiere Extreme Hold provides you with natural hold hairspray and looks good on the dressing table. This is a good sized can which will last a good while, it smells okay. This product does exactly what is promises. I have fine hair which is difficult to hold in a style. This product, although light is not sticky, but holds my hair all day, and gives it a healthy shine. I am thrilled with the results and thoroughly recommend L'Oreal Lumiere Hair Spray. Used by my own hairdresser but lookfantastic sells at a much more reasonable price. The productis as stated. It holds my hair firmly yet does not feel stiff and sticky, and it gives my hair a healthy sheen. I am delighted with this product.